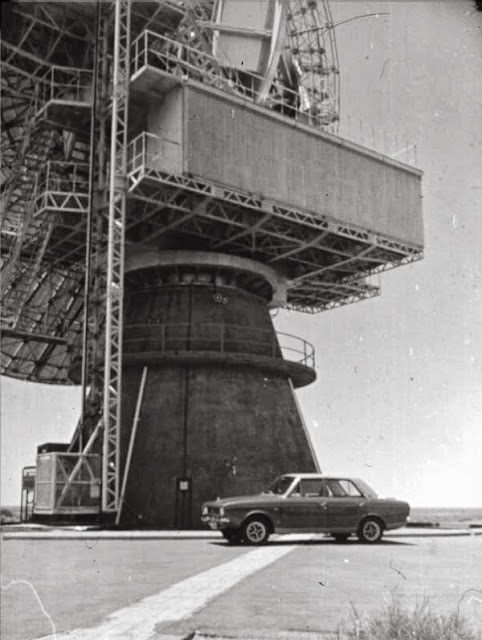 My brand new Hillman Hunter Royal 660 at Carnarvon Satellite Earth Station in Western Australia in August, 1971 (I was transferred to there in '71). This earth station provided comms for the NASA tracking station down the road and also for the Intelsat TTC&M station which was part of the comms site facilities. 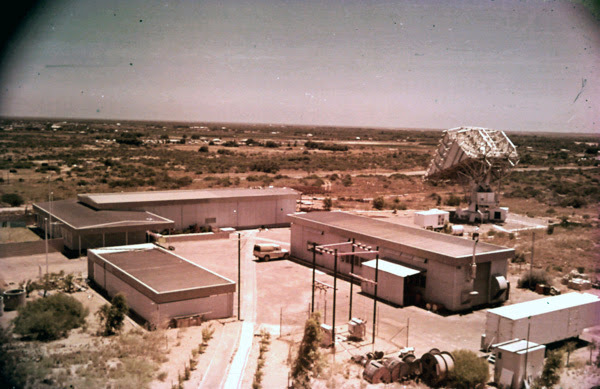 This was the comms site taken from the 30 metre dish above - the Cassegrain antenna on the right was used for TTC&M (Tracking, Telemetry, Control and Monitoring ) of the Intelsat communications satellites. I worked at the comms site and the TTC&M site (both operated by my employer). Last edited by p38arover; 09-15-2013 at 02:43 AM. This one is from my younger days, when I was into riding dirt bikes. 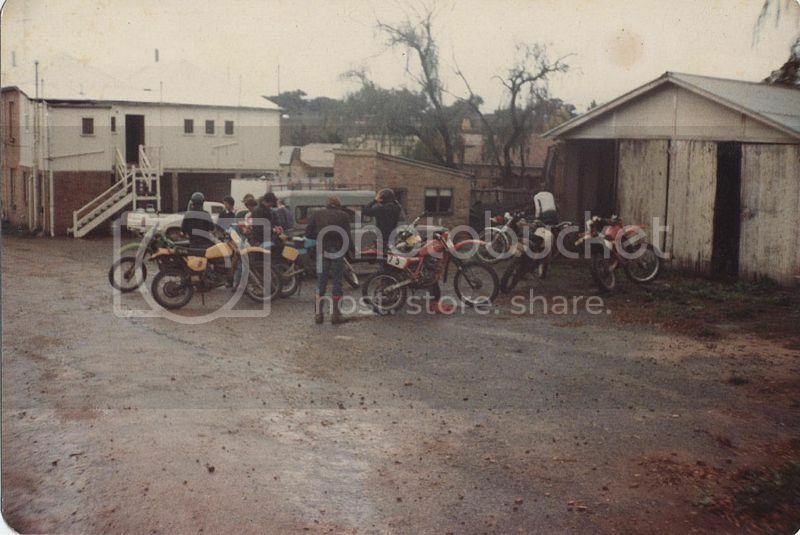 A group of us had ridden our bikes 170klms across the Wollemi National Park to a little town called Rylestone, where we drank copious amounts of beer and ate dodgy local Chinese food. This shot is the scene in the pub carpark,the Sunday morning. We're all severely hungover, and trying to put the basic safety gear on for the trip home. Note the wet conditions. Taken with a point and shoot, possibly my Pentax Sport, in about 1984-85. PS. I was riding a Honda XR200 at that stage. State of the art. Then you might know the Globe Hotel. We went to Kandos to cause trouble, then crashed at the Globe. This is at the rear of that great old country pub..
Hey Arnold -you have been around a few interesting places. Perhaps it is not so much that we aren't as old as you but rather our images aren't as interesting - so I will provide something more mundane. My Dad had a Spotmatic purchased new in the late 1960s and I have digitised a good percentage of his slides by imaging off the screen whil showing via an old Leica projector. He had the Super Takumar 35mm F2 (62mm filter ring), 50mm 1.4 (8 element) and 135mm 3.5 three lens setup. 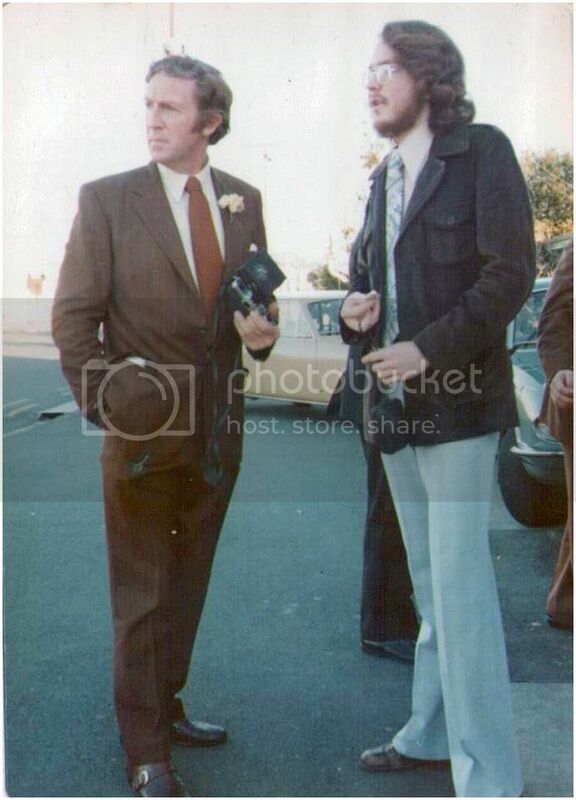 Dad is on the left with the Spottie and probably the 50mm lens and a Stanley aftermarket flash unit. I am holding an Olympus Trip. Taken at my brothers wedding in 1976. Wedding cars were Triumph 2.5 PIs - the green one was Dads. I am 20 Dad 51. I am now older than he is in the pic - yup old photos can bring new perspectives. 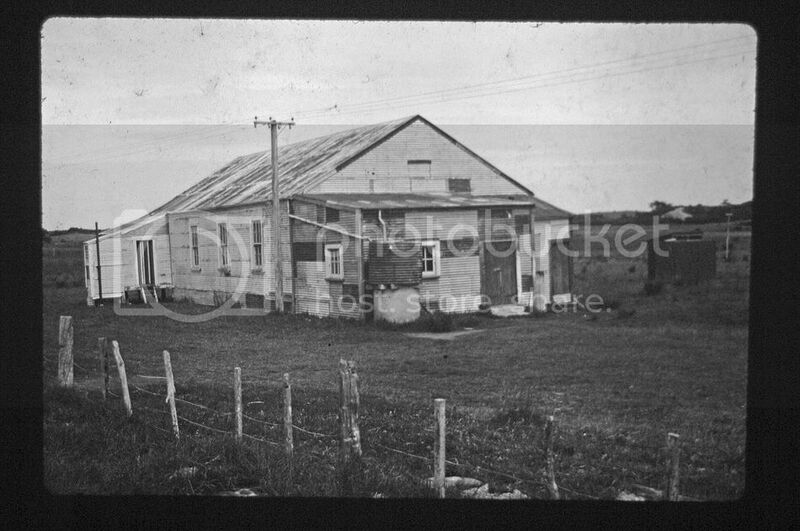 Anyway he took the image below of a corrugated iron community hall in Northland New Zealand around 1968. I did the B&W conversion but didn't do any cleaning. Lots of his slides have heavy fungus growth - some were on Ektachrome some on or something similar. 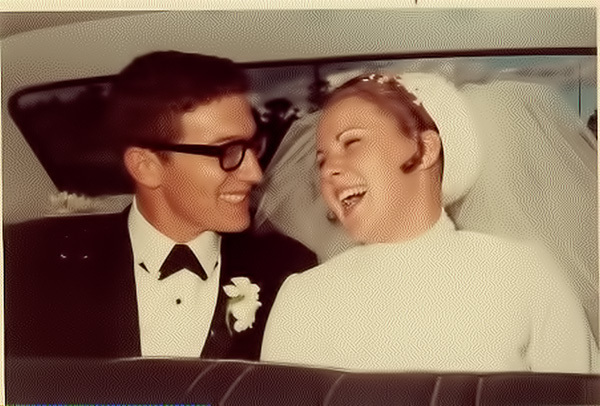 My wedding day in 1970. I'm still with the same bride. I was only 10! I wasn't allowed to go to Kandos pubs! The oldest photo I have uses either daguerreotype or tintype. I didn't take the photo but I could post a scan. Unfortunately most of my oldest photos are family pictures so I can't really post them here. The first roll of slide film I shot was Kodachrome 64. A friend showed me photos he took using Kodachrome of the coronation of Queen Elizabeth. Still amazing colour. It was incredible technology. My ektachrome slides haven't fared as well. Thanks for posting! You want to keep these, as someone may want to use them if they write a history of Australia's roll in astronomy and space. Hillman Hunter - now there is history, the demise of the British motor industry. Great memories there. I wonder how much the town has changed. Well then, see how the memories are stirred. Taken at my brothers wedding in 1976. Wedding cars were Triumph 2.5 PIs - the green one was Dads. I am 20 Dad 51. I am now older than he is in the pic - yup old photos can bring new perspectives. Isn't this a main reason for photos? To freeze a moment in time that we can put away, and pull out every now and then with a fresh perspective? All very interesting, thanks to you all. Old? He look very young to me. . It really looks a picture of it's time with clothing and pose. Thanks for showing us a bit of your past. I have posted this elsewhere I think. A charter we did in 1966. The refueling hose was too short, so we had to taxi right up to the bowser. Problem was there was no tug to push us back from this outback settlement, Yuendumu NE of Alice Springs. All sizes | No Tug? No problem, Passenger-Pushback | Flickr - Photo Sharing! Kodak Retinette 1a and Kodachrome. 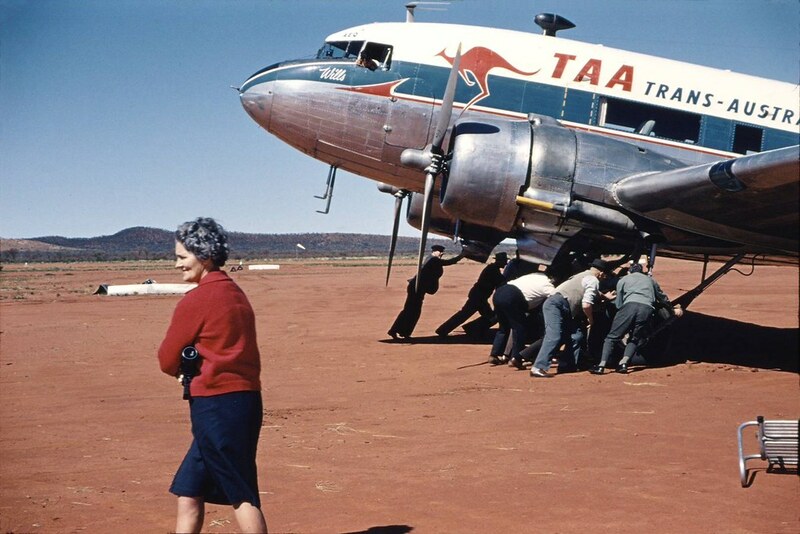 TAA was eventually absorbed into Qantas. Well done, that well beats the average. 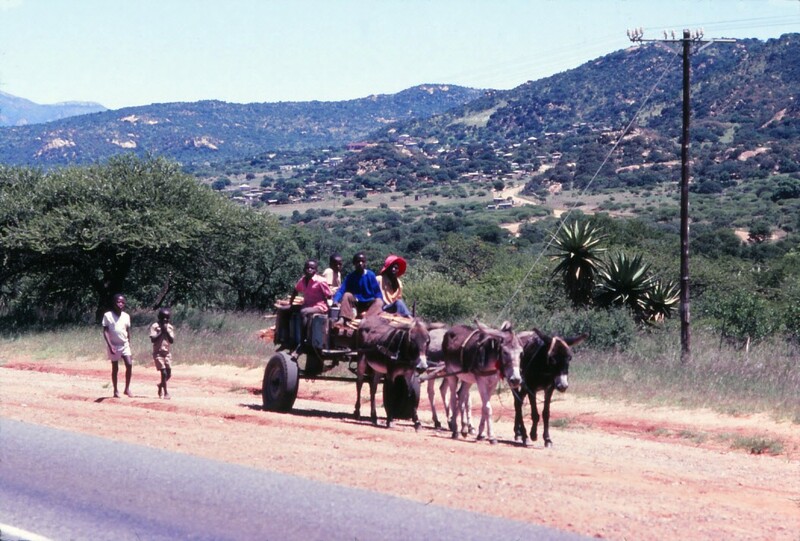 Back then this was a common rural scene. Notice the settlements on the hill behind. Last edited by arnold; 09-15-2013 at 07:31 AM. During the Boer war at the turn of the last century, the British resorted to building Block Houses. This map shows the staggering area they covered, separated within easy sight of each other. A few still remain, and I photographed this one in 1981 with a Pentax MX and 50mmf1.7 on Kodachrome. The wide area across which the British had to stretch themselves made the supply points and lines of communication very vulnerable. The solution that was derived to protect them was the system of blockhouses. Initially the blockhouses were to be erected at strategic points such as bridges. 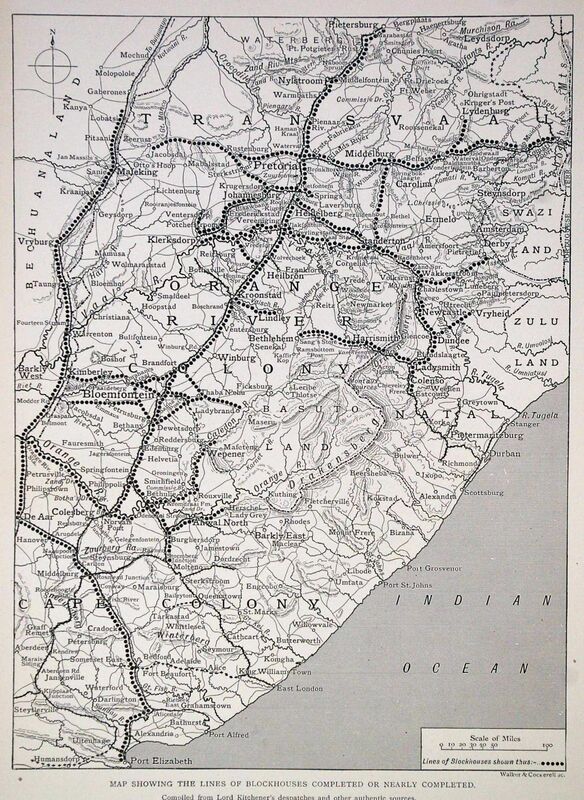 However, the idea was expanded to both guard the railway line and the present barriers designed to limit the free movement of the Boers across the countryside. To achieve this, blockhouses were constructed at regular intervals along the railway lines. Troops were stationed in and around each blockhouse and the number of men garrisoned varied. 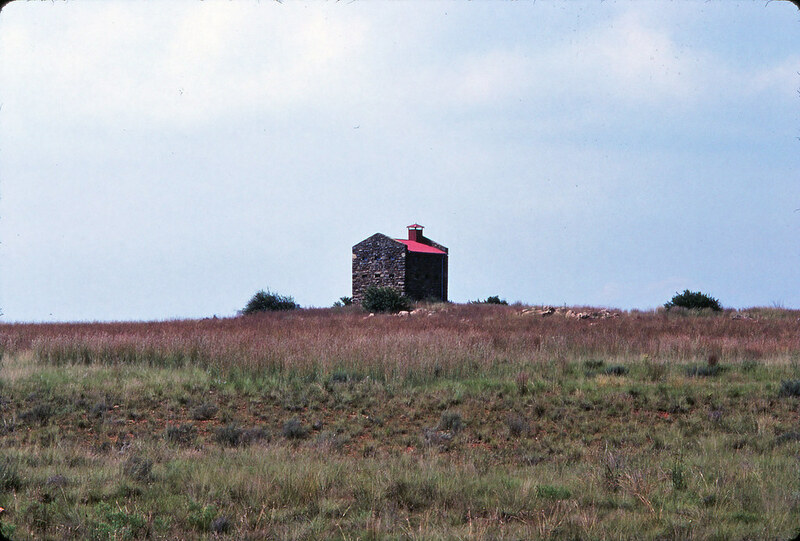 The desire to limit the area used by the Boers led to another expansion of the use of blockhouses. Now they were to be used to protect main roads and ultimately to partition the country into areas that could control the Boer movements. For the most part, the design of a blockhouse was standard although blockhouses where build using existing structures on some occasions. The designer of the blockhouse, Major Rice RE and the men of the Royal Engineers set up manufacturing units to make the component parts. These were then shipped to wherever they were needed. The standardisation of design meant the blockhouses could be constructed quickly and with parts from different manufacturing units if necessary. Construction of the blockhouses was the responsibility of the army with guidance and support provided by the Royal Engineers. The distance between blockhouses was calculated to be able to extent the reach as far as possibly but at the same time to prevent the Boers from passing unnoticed between them. The average distance apart was about 1,000 yards (910 m). Line of sight was vital and this required a greater density of blockhouses in some areas. The gap between blockhouses was filled by wire fences. These fences did not run along the shortest distance between the blockhouses but zig-zagged so that the troops from both blockhouses could fire at the enemy between themselves but without the chance of hitting the other blockhouse. The first fences were made from barbed wire but experience showed that this could be cut easily. Steel wire ¼ in (6mm) thick was imported to provide a more long-lasting deterrent. The fences were often connected to cans containing stones or other devices that could alert the troops to movement or activity somewhere along the length of the fence. The blockhouses impeded the movement of the Boers and contributed to bringing the war to an earlier close than would have been the case if they has not been used. Thank you all for sharing their amazing shots from their past as well as so many great and fascinating descriptions.. Keep it up guys please ! !